I know we've tried this before, but whats the harm in trying again? Let's get BoA trending with the hash tag "#BoAONLYONE" on twitter! We can do this by at 12 pm KST (this is in about 3 and a half hours), not only should we click the "BUY" button for her digital version of the album, but we should also put in supportive messages to BoA for her comeback on twitter. "She will always be the queen in my eyes #BoAONLYONE"
"BoA's comeback album is AWESOME! #BoAONLYONE"
Post and reblog others' tweets to see if we can make is into the trending topics of the night on twitter! I know we can do this guys! I was trying to make better sense of it in the hashtag, but alright. We're trending! I spammed like crazy! Edited by superlita, 21 July 2012 - 07:38 PM. OMG! First time BoA trend in twitter????!!! 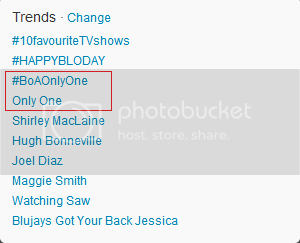 Congrats to BoA and Thanks to those who are helping to trend #BoAOnlyOne! YAY! BoA ONLY ONE is trending!!! So happy! Edited by superlita, 21 July 2012 - 10:12 PM. 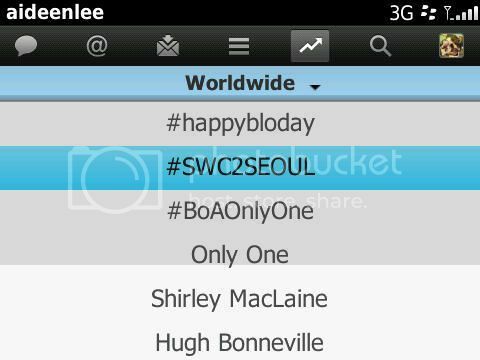 never see #BoAOnlyOne touch the Worldwide Trend so far ! ok best wishes for you then .